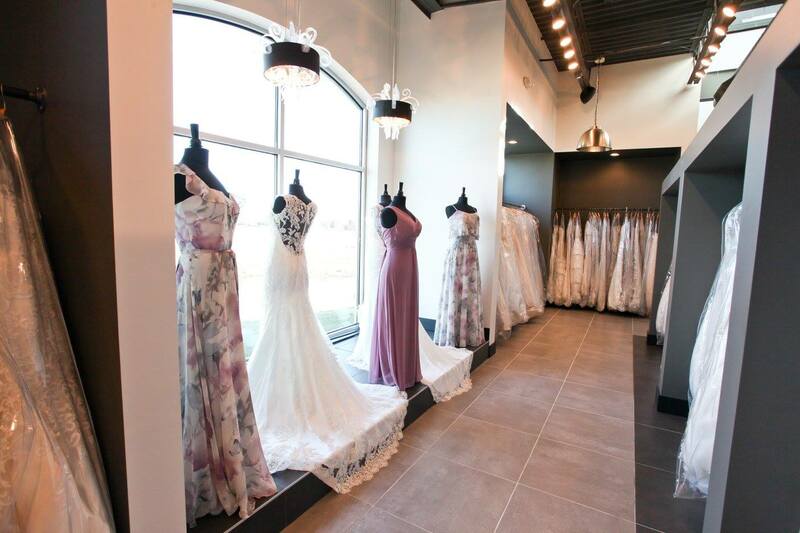 The bridal stylists at The Dress Shop love this wave of new styles, and we are always ready for brides who want to explore all the different options beyond a traditional white wedding dress. This is your Big Day, so you should be wearing something that fits your personality, makes you feel beautiful, and of course, something you’ll be comfortable in. We put together a few ideas to help you say “I Do” to your fun, unique, non-traditional formal wear. Use these ideas to pull some inspiration for a personalized wedding day style! Don’t be shy—we love fun ideas! Our stylists are here to work with your vision, so tell us what that is. Come in with some pictures that inspire your idea, make a list of details you like, and don’t be afraid about being “picky.” We’ll find you what you want! A dress doesn’t have to be a single pattern, fabric, or color. A textured, ruched dress, or a floral sundress-inspired gown can add dimension and depth to your look (and your photos!). A floor-length dress isn’t for everyone.Maybe you want to show off your beautiful legs, or you want extra room to dance. Choose a vintage tea-length dress, a bold high-low, or a fun knee-length dress. Adding a personal touch to your dress can go a long way towards making it a one-of-a-kind. Wear a belt—bold and wide, or thin and dainty. Add some metallic or crystal embellishments, or go for flared lace sleeves. Satin, classic lace…who says you have to stick with traditional materials for your wedding wear? Mix it up with materials like velvet, leather, tulle, or sheer lace. Guess what? You don’t have to wear a dress! That’s not every bride’s style, and what you wear on your wedding day should be what you feel most beautiful and comfortable in. Some fun new trends include classic-style suits, high-waisted skirts, and jumpsuits. Don’t let the idea of the traditional white dress keep you from wearing what you really want on your wedding day. You’ll be looking at picture of yourself and your spouse on your wedding day for years to come, so make sure you love your look! If you aren’t sure where to start, or what to bring to your first styling consultation, get in touch with us by email, or at 517.546.3600. We’ll help you from the very beginning of your search for the wedding attire of your dreams – whatever that may be!